This 415-page book contains 360 Astro*Images, which are tarot-cards for astrology covering all of the traditional 3-way planetary combinations as used by professional astrologers. In addition to the Astro*Image cards are full written text interpretations by astrologer Michael Erlewine, which cover the meaning, relational concepts, keywords, and other information related to each combination. 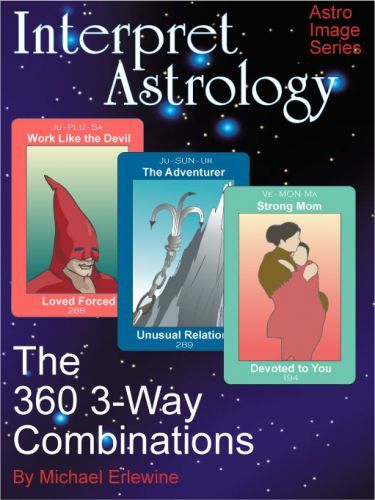 The 360 3-way combinations can be used to read any aspect pattern in the astrology chart. They can also be used to read "Planetary Pictures" and midpoint trees as developed by the German astrologers Alfred Witte and Reinhold Ebertin. This book is intended as a self-reading horoscope and guide to interpreting the many aspect patterns in natal horoscopes or charts. Also included is an introduction to finding and using aspect patterns in the natal chart. Jargon aside, this is a book for beginners and professionals alike, filled with lovely images and text.